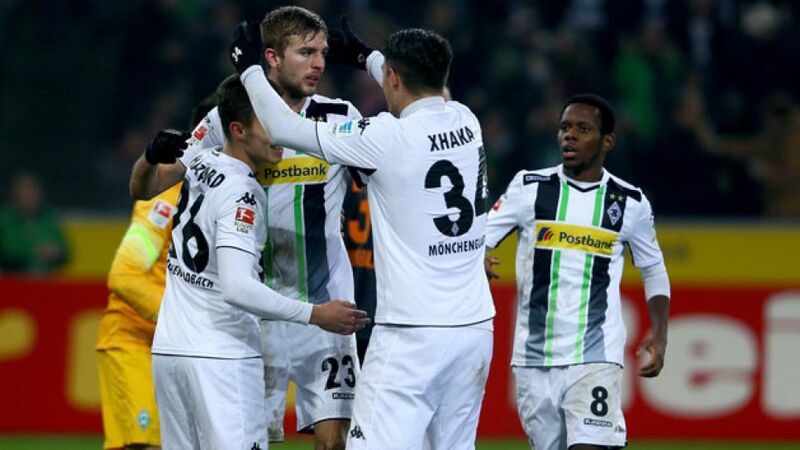 Mönchengladbach - Borussia Mönchengladbach closed the gap on second-placed VfL Wolfsburg as they collected a comfortable 4-1 win over bottom-of-the-table SV Werder Bremen on Wednesday evening. First-half efforts from Max Kruse and Oscar Wendt set the Foals on their way and, while Zlatko Junuzovic pulled a goal back for Bremen, Christoph Kramer's header coupled with Luca Caldirola's sending off and Branimir Hrgota's first goal of the season saw Gladbach stretch their unbeaten streak to three games. Despite making a more promising start to the match, Bremen failed to convert their early chances and soon began dropping deeper in an attempt to lull their hosts into a false sense of security. Gladbach’s passing game was on point, yet lacked penetration and it took a foul on Ibrahima Traore inside the area to produce the opener as Kruse stepped up to send Raphael Wolf the wrong way from the penalty spot. It was no less than the Foals’ dominance had deserved and Lucien Favre’s side duly added to the scoreline before the break as Wendt’s effort deflected off of Caldirola to loop over a helpless Wolf. Six minutes after the restart though, and another stunning free-kick from Junuzovic handed Bremen a lifeline, which was duly squandered when Kramer restored the hosts’ two-goal lead, heading home from Kruse’s lofted delivery. Things went from bad to worse for the side propping up the table when Caldirola picked up a second bookable offence for a reckless challenge on Thorgan Hazard. The sending off only contributed to Gladbach’s bombardment of the Bremen goal as Traore cut in off the right flank to sting the palms of Wolf from the edge of the area, before Hrgota’s late tap-in wrapped up a convincing win for the Foals.